Making home organizers of plastic bottles is one of simple ways to reuse and recycle plastic bottles, adding inexpensive home organizers to your room decor and creating more comfortable life. 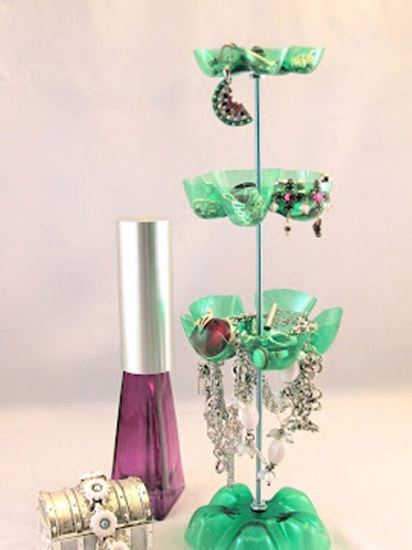 Making a jewelry organiser of empty 2 L plastic bottles is a quick and fun project you will like. 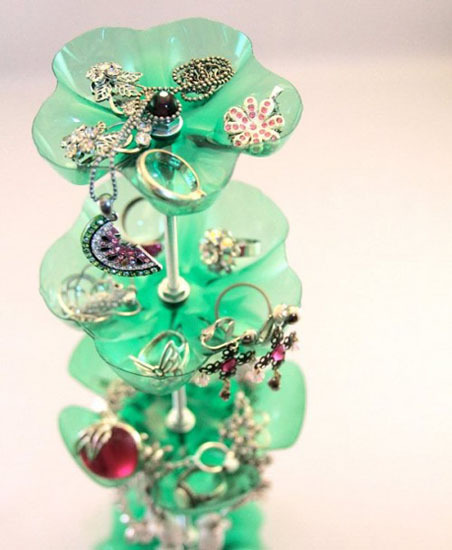 If you want to make a simple and original jewelry organizer that look attractive, fresh and interesting and do not want to spend a lot of time, this picture tutorial and recycled craft ideas are for you. Find a threaded rod, nuts and washers and some plastic bottles to make this simple and very decorative accessory for your room. You will need 2 liter plastic bottles, one 1 liter and one 20 oz plastic bottles to make large and small trays. Drill holes that are the same size as your threaded rod in the center of each tray. Cut as far down into the plastic as you can with scissors, and then use a Dremel to smooth the jagged bottom edge. Then use small nips to trim off any stubborn excess fuzz. Sandwich each tray between two washers between two nuts. If your drilled holes are the correct size, each tray will be tight enough that you’ll need to screw it into place on your threaded rod.